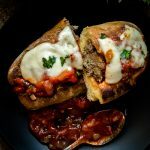 Getting a healthy dose of Newfoundland Moose Meatball Subs this week! Moose meat isn’t known for being the most tender of meats, but we’ve got a recipe for the juiciest, most tender meatballs you could want. We also made a super easy marinara sauce to top them with, and of course finished them off with fresh mozzarella and parmesan cheese. If you’re any kind of rural Newfoundlander, chances are you or a family member has some moose meat stashed away in the freezer. 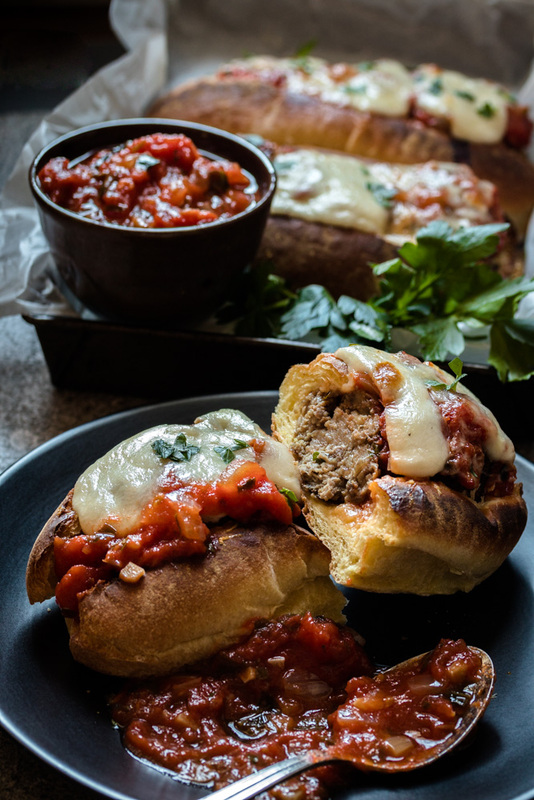 Well it’s time to break out the ground meat and makes some meatball subs, friends! 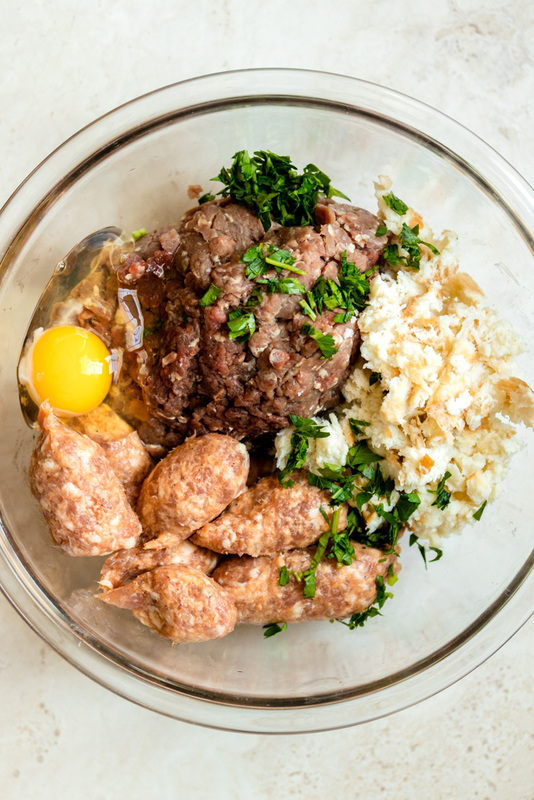 The base for the meatballs is a simple combination of ground moose, Italian sausages, fresh parsley, bread, milk and an egg. Using Italian sausages is perfect, because they come already seasoned. Which means there’s a little less chopping involved to season the meatballs. As for the marinara, it is just a classic sauce made of onions, garlic, olive oil, canned tomatoes and a few fresh herbs. Good quality oil, tomatoes and fresh herbs make all the difference in the world for how good your sauce will turn out. We use San Marzano tomatoes from Italy, but a good quality whole canned tomato is fine. This is not a hard recipe to make, but you will need to fry the meatballs in batches, or use two frying pans. Our recipe makes 25 meatballs and we only put 3 per sub, so there’s enough for leftovers. You could also bake the meatballs, we just prefer meatballs fried and haven’t attempted baking them yet. 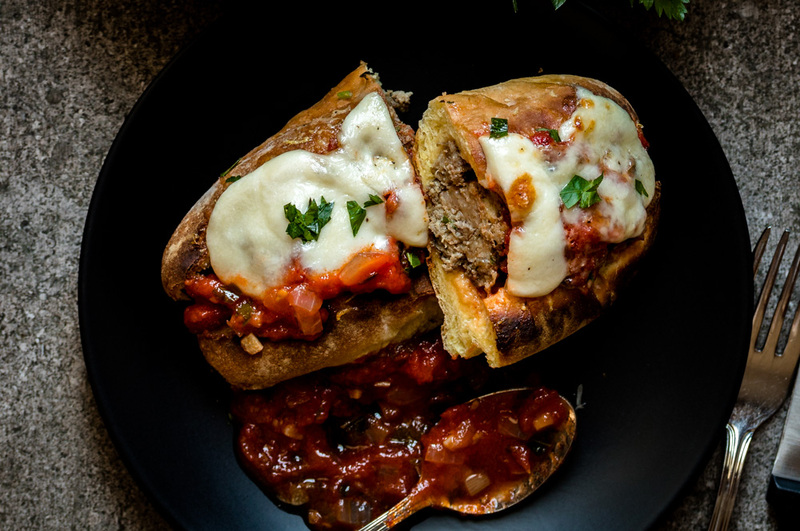 Let us know what works if you try baking the meatballs! If you give our recipes a try, be sure to let us know here in the comments section, or on Facebook & Instagram. Happy Cooking! Juicy & tender moose meatballs in a delicious homemade marinara sauce. Start by pouring the 1/4 cup milk over the dinner roll and allow it to soak up most of the liquid. If the roll is dry it may soak up all the liquid, but if not, just gently squeeze the roll to remove excess milk. Add the roll to a bowl and tear it into small bits. Add the moose meat, sausage, parsley, and egg to the same bowl and stir until well combined. Roll into balls and set aside, you should get roughly 25. Heat a sauce pan over medium heat and add 1/4 cup olive oil, along with the chopped onion. Cook for 5 minutes, until onion is soft but not browned, then add your garlic and fry for 1 more minute. Break up the tomatoes with your hands, while they are still submerged in the can (less chance of squirting you with tomato juice), then add to the pot, along with the parsley, and 1/2 tsp salt and some cracked black pepper. Bring to a simmer, then cover and cook for 30 minutes, stirring occasionally. Remove the cover and stir in the basil, cook until sauce is thick. Taste and add more salt and pepper, if necessary. Meanwhile, heat a tbsp of oil in a large frying pan over medium low heat, and cook the meatballs in two batches, turning them until they are brown on all sides and cooked through, about 20 minutes. Drain on a paper towel lined plate. Place an oven rack under the broiler and turn the broiler on high. 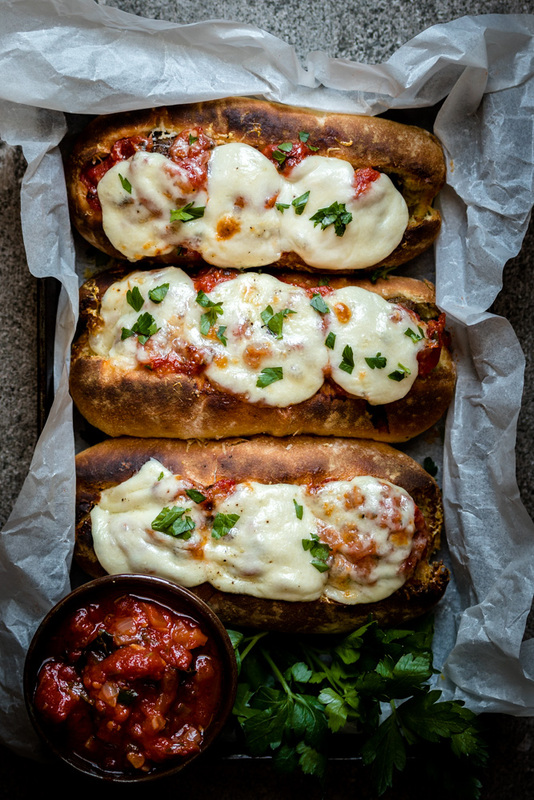 Slice the buns on the top, then spread butter on the bread, top with 3 meatballs per sub, some marinara, Parmesan cheese and a few slices of mozzarella. Place on a tray under the broiler, and cook until cheese is melted and starting to brown, 3-4 minutes. 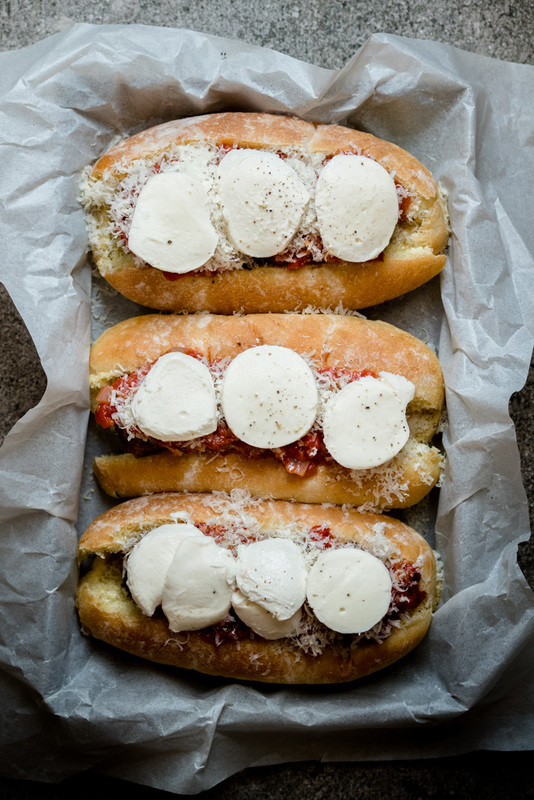 You may need to cover the buns with foil to prevent them burning before the cheese melts. Watch carefully as they can burn quite easily and everyone’s broiler is different. Serve immediately with a fork and knife, and some extra marinara sauce!